Data released by the Federal Reserve Bank of New York indicates that aggregate consumer debt fell by 0.2%, $18 billion, between the first and second quarter of 2014. Overall, consumer debt still remains 8.2% below the peak of $12.7 trillion reached in the third quarter of 2008. 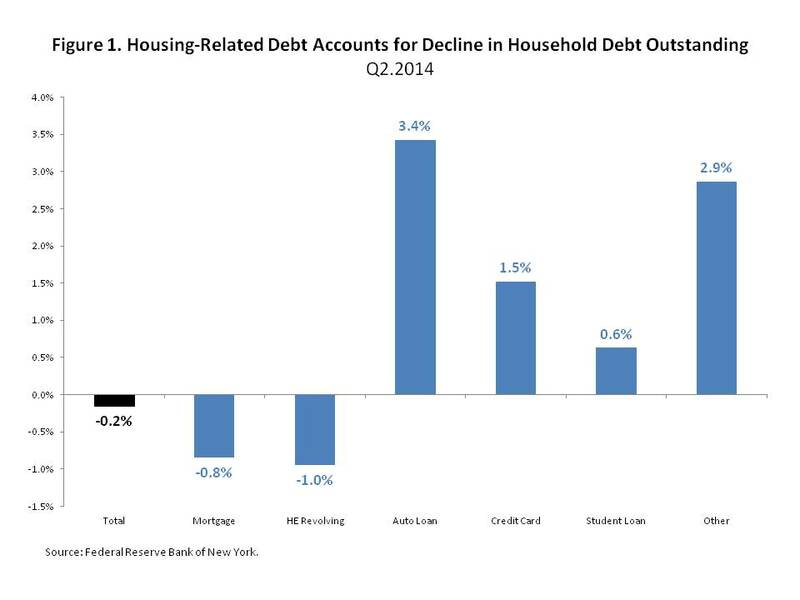 As Figure 1 illustrates, housing-related debt accounted for the decline in total household debt outstanding. Over the quarter, housing-related consumer debt outstanding shrank by 0.9%, $74 billion. According to the figure, mortgages, the largest component of household debt, decreased by 0.8%, $69 billion, from their level in the first quarter of 2014. Balances on home equity lines of credit fell by 1.0%, $5 billion. In contrast, non-mortgage consumer debt outstanding rose by 1.9%, $56 billion, over the quarter. Auto loans increased by 3.4%, $30 billion, credit card loans expanded by 1.5%, $10 billion, student loans grew by 0.6%, $7 billion, and other loans, which includes consumer finance (sales financing, personal loans) and retail (clothing, grocery, department stores, home furnishings, gas, etc) loans, climbed 2.9%, $9 billion. Despite the quarterly declines in housing-related consumer debt outstanding, data from the Federal Reserve Board indicates that bank lending standards for most of these products eased over this same period. According to Figure 2, a net share of 18% of bank loan officers reported that their bank’s lending standards on prime residential mortgages had eased over the second quarter. The “net share” is calculated by taking the difference between the percentage of bank officers reporting that lending standards eased over the period and the portion reporting that lending standards tightened over the quarter. In concert with prime residential mortgages, a net share of 6% of bank loan officers reported that lending standards on non-traditional residential mortgages offered by their bank had eased. 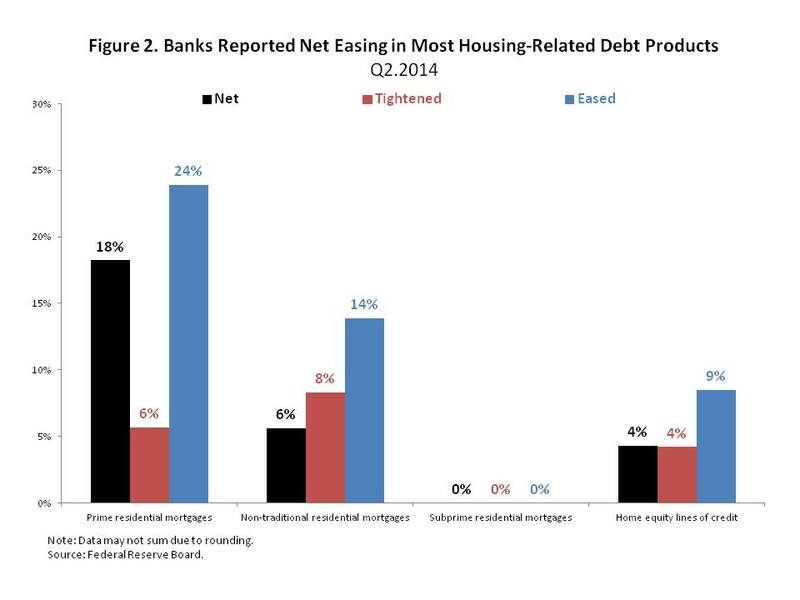 Similarly, a net share of 4% of bank officers reported that lending standards on home equity lines of credit offered by their bank had eased. However, standards on subprime mortgages were unchanged over the period. However, while lending standards for most housing-related debt eased over the quarter, they still remain tight. The same iteration of the Federal Reserve Board’s Senior Loan Officer Opinion Survey asked bank loan officers to describe the lending standards currently prevailing at their bank, relative to the midpoint of the range between the tightest and the easiest that lending standards have been between 2005 and the present. Figure 3 below documents the results. According to the figure, a net share of 7% reported that lending standards on auto loans were easier than the midpoint of the range of standards recorded since 2005, while a net share of 2% and a net share of 3% reported that lending standards on prime credit card loans and other consumer loans respectively were tighter than the midpoint of the range of standards recorded since 2005. 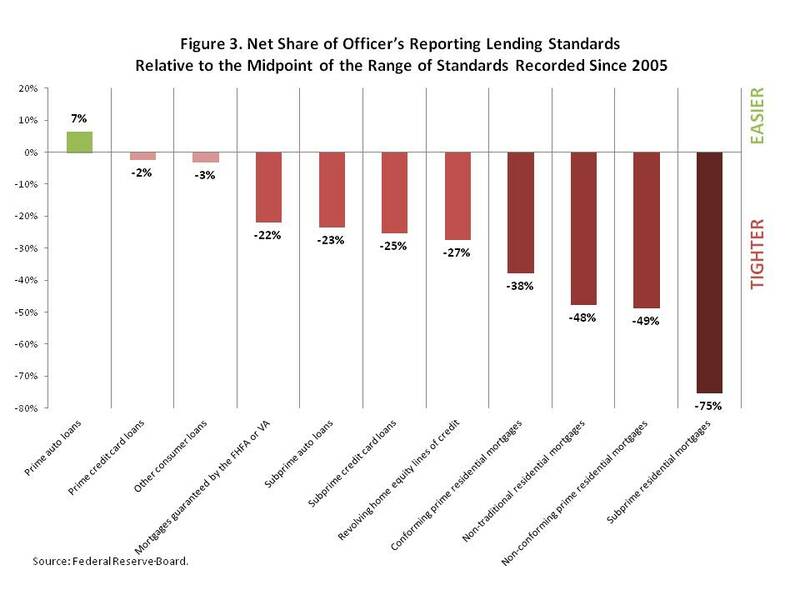 In this case, the “net share” represents the difference between the percentage of officers reporting that lending standards at their bank where tighter than the midpoint of the range of standards recorded since 2005 and the proportion of bank officers indicating that lending standards were easier than the midpoint of the range of standards recorded since 2005. For housing-related debt, the disparity was greater. According to the figure a net share of 22% reported that lending standards for purchase mortgages guaranteed by either the Federal Housing Finance Agency or the Veteran’s Administration were tighter than the midpoint of the range of standards recorded since 2005. Similarly, a net share of 27% of bank officers reported that lending standards on home equity lines of credit were tighter than the midpoint of the range of standards recorded since 2005. These percentages were on par with bank loan officers’ reporting for subprime auto loans and subprime credit card loans. As the figure also shows, the net share of bank officer’s reporting that lending standards are currently tighter than the range of standards recorded since 2005 is even wider for other purchase mortgage products.